In Spot welders for the home workshop, Part 1 we looked at how spot welders work, and their potential usefulness in a home workshop. 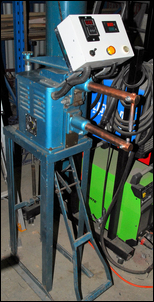 In Spot welders for the home workshop, Part 2 we looked at buying second-hand, an approach that can save money and also potentially get you a more powerful machine than is currently being sold for single phase, 240V use. 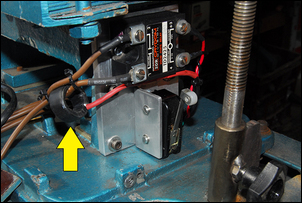 In this article, we look at adding electronic control to an older spot welder. This project is suitable only for those who have a good knowledge of mains-powered devices and using solid state relays to control mains power. 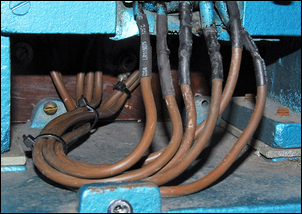 Incorrect wiring could result in a dangerous welder! The welder must be disconnected from mains power whenever work is being done on it. The welder must be earthed. Modifications must not result in exposed, live wiring. The welder may get very hot in use, even if used for only a trial spot weld. If you have any doubts at all as to your capability to perform work of this sort, do not do it! We have deliberately chosen not to include a circuit diagram of the welder modifications: if you have sufficient knowledge of the above, the actual circuit will be quite straightforward. The old spot welder that I bought uses a multi-positon switch to select welding current. This switch selects different taps on the transformer. Settings are available from ‘1’ to ‘5’, with ‘4’ and ‘5’ being the settings used in most conditions. There’s nothing at all wrong with this manual control, so it’s being retained, unchanged. 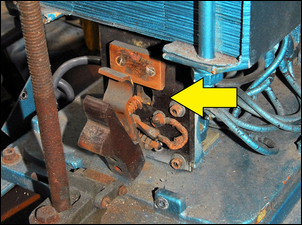 Because the arms of my standard welder are closed by a foot pedal, pre-weld clamp time, welding time and post-weld clamp time are all set by movement of the operator’s foot. 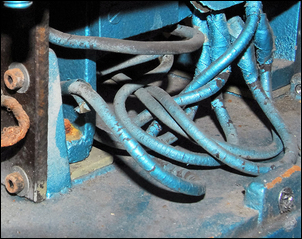 The pre- and post- times are not so critical but the duration of the weld time is very important. I therefore decided to add an adjustable electronic timer that would allow the welding duration to be accurate and repeatable. The magnitude of the pressure applied by the electrodes to the work is also very important. 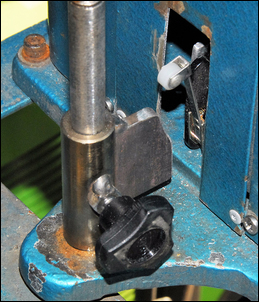 On my old machine, this is set by spring pressure that the foot pedal applies to the upper arm. However, in standard form, because there is no indication of how much the spring is being compressed, there is no way of setting how much pressure is actually applied… other than by the amount of foot movement. Push down a bit more, and the weld pressure can go up by 50 per cent! I therefore added a ‘stop’ in the form of a collar (arrowed) that gives a repeatable pressure. 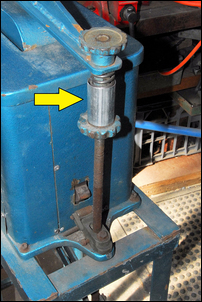 Push down on the foot pedal until the stop is just reached, and the spring applies a fixed and repeatable pressure, even as the weld cools and shrinks. As described earlier in this series, these welders draw a lot of current from the mains. Put simply, they draw two to three times as much current as they’re meant to – but get away with it by doing so for only short periods, spaced well apart. So what would happen if you went on a welding frenzy? The answer would be that that things would get hot – including the welder’s transformer. A fan to cool the transformer and wiring was then added. Finally, with these simple transformer-type spot welders, the amount of secondary current (the current that does the welding) depends on the mains voltage, as received by the welder. And because of the very high current draw, the voltage drop can be considerable. Throw in a mains voltage where I live that can vary by 20 volts or more (and that’s off-load! ), and I decided to add a mains voltage display. When looking for one of those, I realised that I could add a current display at little additional cost – so I bought a combined voltage / current meter. Beware Tough Rubber Sheath insulation! This type of insulation is notorious for degrading into a crumbling mess – and heat makes the degradation even worse. In fact, all the cables that connected the switch to the transformer were in very poor condition. The actual transformer winding connections (insulated with cloth) were fine, so all the rubber-insulated connections between the transformer and switch were replaced. 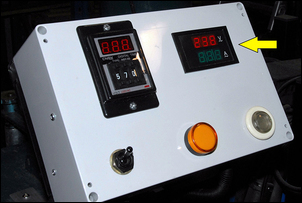 - New control panel has main on/off switch, ‘welding occurring’ pilot light, manual weld over-ride pushbutton, adjustable digital timer, and combined mains voltage and mains amperage meters. - Small power supply generates 12V for solid state relay control, digital timer and pilot light. Let’s take the major parts one at a time. 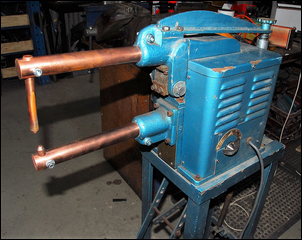 As indicated in Part 2 in this series, this welder can draw up to 28 amps when set to its highest power, and takes a 38-amp gulp when first starting the weld. These are very high currents at 240V, and would cause problems to most relays – instead of a normal relay, you’d need a high current motor ‘contactor’. However, help is at hand by using a solid state relay – basically, a transistor switch housed inside a module. There are no moving parts and so compared with a mechanical switch or relay, the life is vastly greater and the ‘on’ resistance likely to much lower – especially over time. A Crydon TD2425 solid state relay was used. This is rated at 25 amps continuous and has a maximum surge current rating of 250 amps. 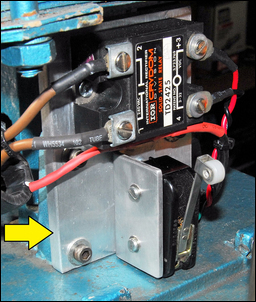 While the welder can draw more than 25 amps, it does not do so continuously - so this relay should be fine. Similar relays are available on eBay for under AUD$20. Given that welding occurs for such short periods, I wondered if a heatsink would even be necessary for the solid state relay, but some testing of the bare relay showed that it was getting warm. To address this, I decided to mount it on a thick aluminium plate that would work as a heat-sink. Heat-sink compound was spread between the solid state relay and the heatsink. The solid state module is operated by a low voltage, low current source – 12V in this case. 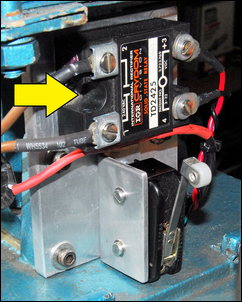 The micro-switch is the main trigger for the welding current to flow. 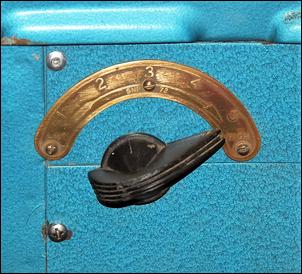 In the original welder, a heavy-duty switch was operated by the movement of the foot pedal. This switch comprised big chunks of copper, and worked directly on the mains power supply to the transformer. To replace this, the original switch was removed and was replaced (working in much the same position) by the micro-switch. Triggering the micro-switch is a cam plate. To get the trigger point at precisely the right point, the cam plate needs to be vertically adjustable. This adjustment is provided by a thumbscrew that can be unlocked when the height of the cam plate needs to be adjusted. 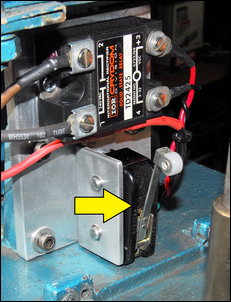 With the micro-switch and the solid state relay fitted, the welder could have been operated as previously – that is, a switch tripped by movement of the foot pedal, with welding time determined by the operator’s foot movement. (This would mean the solid state relay would be activated by the micro-switch.) In fact, I did test the welder working in just this way and the performance was good – the solid state relay probably having less ‘on’ resistance than the old copper contacts of the original switch. However, in the final version, instead of feeding power to the solid state relay, the micro-switch powers the digital timer. Therefore, when the switch is tripped, the digital timer’s output is activated, so switching on the solid state relay and starting the timer countdown. When the timer reaches zero, the sold state relay is turned off, ending the weld current period. The heart of the new control system is this digital timer. Available very cheaply on eBay (search for “AC/DC 12V 8 Pin DPDT 0.01-9.99 Second 9s Time Delay Relay Timer Black ASY-3D”), the timer uses thumbwheel adjustable switches to set the output time anywhere from 0.01 to 9.99 seconds. At the time of writing, it costs just AUD$15 including postage. When the timer is powered-up by the micro-switch, the internal output relay is energised. The digital display then counts down the timed period and when this has ended, the output relay is turned off. Well that was the theory! Unfortunately, the timer cannot be configured in this way. Instead, the nearest function is that the relay output of the timer is on when you’d like it to be off, and off when you’d like it to be on. To achieve the required reversal in function, an automotive 12V normally closed relay was added to the circuit. So with the timer and additional relay working, the output relay of the timer activates the normally closed relay that in turn triggers the solid state relay, in turn feeding mains voltage to the transformer (and so a much larger secondary current to the welding tongs). It does this for only the user-selectable timed period. In addition, the output of the timer switches on the ‘welding occurring’ pilot light – this light is wired in parallel with the solid state relay input. A 12V LED pilot light was used for this function. In parallel with the additional relay’s output is the manual over-ride welding pushbutton. 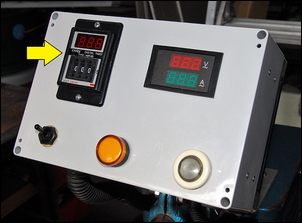 With the timer set to 0, this allows the operator to determine the welding time – when the micro-switch activated by the foot pedal, welding time continues for as long as the finger is on the button. Note that an 8-pin socket is required for the timer – it’s purchased separately. 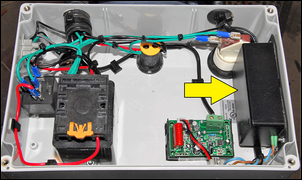 Twelve volt power for solid state relay control, digital timer, pilot light and cooling fan is provided by the guts of a 12V regulated switch-mode plugpack, mounted within a new insulated plastic box. The main on/off switch on the ‘dashboard’ turns on this power supply. The fan runs whenever the switch is on. Note that I chose to not switch the mains supply to the 12V power supply and voltage / ammeter. This means that whenever the wall socket is on, the meter is alive. The combined volt and amp meter is available on eBay – search under “AC 80-300V 100A LED Panel Digital Ammeter Voltmeter Volt Amp Meter 110 220-240V”. At the time of writing it cost just AUD$14, including postage. The voltage is monitored by the same leads that power the meter – just connect to the mains input. The current is monitored by means of a Hall Effect sensor that comprises a ring through which one of the mains power conductors is passed. (Note that there is no electric connection between this monitoring device and the conductor.) The output of the Hall Effect sensor is then connected to the on-board socket of the display. I used shielded cable to make this connection. The changes have revolutionised the welder. How? In some ways, not as was expected! Firstly, the use of the electronic timer means that, especially when weld times are short, excellent results can be obtained. My test for this is to weld two steel nails together. This welding requires precise timing – because of their low thermal mass, too long a welding period and the nails completely melt – but too short and the weld is not strong. If welding on a power of ‘4’, even 0.2 seconds too long and problems can result. However, with the use of the timer, consistent welds can be made each time on tricky materials. Secondly, the voltage and current displays have proved to be more useful than expected. If the contact between the materials being welded is not effective (for example, there is residual paint, plating or corrosion), the current flow shown on the meter is much lower than normal. This immediately alerts the operator than the weld is not going to be effective. 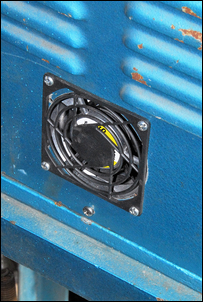 Finally, the cooling fan keeps transformer temperatures noticeably lower than occurred previously. Modification of the welder was not a quick and easy project, but the results – both in terms of total cost and welding capability – are excellent.